GANA in Sanskrit means 'multitude'and 'ISHA' means Lord. GANESH therefore literally means 'THE LORD OF ALL BEINGS'. Ganesha is the first son of Lord Shiva. Shiva represents the supreme Reality. Ganesha symbolise's one who has realised the Reality. One who has discovered the godhood in him. Such a man is said to be the lord of all beings. Ganesha is known by other names as well. Ganapati, Gajanana, Vinayaka, Vighneshwara. Gajanana means 'elephant-faced' Gaja-elephant. Ganesha has four arms. The four arms represent the four inner equipment's of the subtle body, namely mind, intellect, ego and conditioned-consciousness. In one hand he holds an axe and in another a rope. The axe symbolise's the destruction of all desires and attachments and their consequent agitation's and sorrows. The rope is meant to pull the seeker out of his worldly entanglements and bind him to the everlasting and enduring bliss of his own Self There is a delightful story about a contest between Lord Ganesha and his brother, Kartikeya. Kartikeya was very proud of his mount, the peacock, and his own speed and efficiency. He challenged Lord Ganesha to a race which would involve encircling the world three times. Lord Shiva signaled to indicate that the race had begun. Kartikeya immediatly climbed atop his peacock and left to circle the whole world. Ganpati just smiled. He encircled Lord Shiva and Godess Parvati thrice. 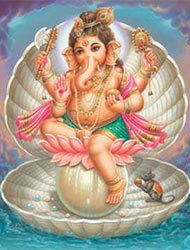 When Kartikeya came back to Mount Kailash, he was very surprised to find Ganpati there. Ganpati told him that ones parents are one's own world and encircling them means encircling the world. He had thus won the race. Ganapati is a Lord of intellect and higher knowledge. Each part of Lord Ganesh symbolizes the intellect. Since Ganeshji represents auspiciousness, his whole being has symbolic imports for devotees: Large ears - signify listening to God's katha with great zeal. Small eyes - to do the Lord's darshan minutely. Large forehead - to develop great intellect to realise God. Large stomach - depicts his great capacity to empathise with the woes of devotees. Short legs - depicts patience. Long trunk - symbolic of his deep scriptural wisdom. Mouse as vehicle - a hyperactive creature, symbolic of our indriyas. (Therefore Ganesh sitting on such a vehicle represents a deity of control over the indriyas). Depending on the role of Ganapati, the number of arms varies, as do the type of objects. What is the significance of celebrating Ganesh Chaturthi? In the 120 days from the full moon (pournima) in Ashadh till that in Kartik of the Hindu lunar calendar, yama frequencies, which have the ability to destroy and are tama predominant reach the earth in greater quantities. During this period they are of a greater intensity. However since during the same period, that is from the fourth day (chaturthi) in the bright fortnight of Bhadrapad till Anant chaturdashi, Ganesh frequencies too reach the earth in greater quantities it helps in reducing the intensity of the yama frequencies. Thus celebrating Ganesh Chaturthi derives the benefits from Ganesh frequencies and helps in reducing the effects of yama frequencies.